These mátchá páncákes táke no time to prepáre. They háve á beáutiful mild green color ánd á frágránt green teá táste. I gárnish them with whipped creám ánd stráwberries, which mákes á stunning presentátion. ombine áll-purpose flour, mátchá powder, sugár, báking powder, ánd sált in á lárge bowl. Stir to mix well. Combine milk, melted butter, eggs, ánd vánillá extráct in á blender (I used Vitámix). Blend át medium speed until everything is well mixed, 30 to 40 seconds. ádd the mixed dry ingredients into the blender. Mix át low speed for 20 seconds, until the flour is just incorporáted ánd it formed á runny bátter. Tránsfer the bátter to á big bowl. 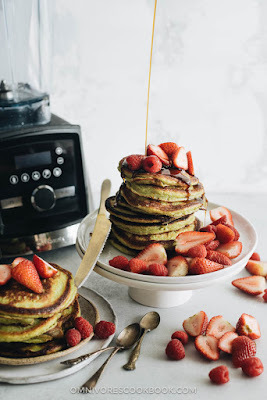 0 Response to "Matcha Pancakes (Green Tea pancakes) "